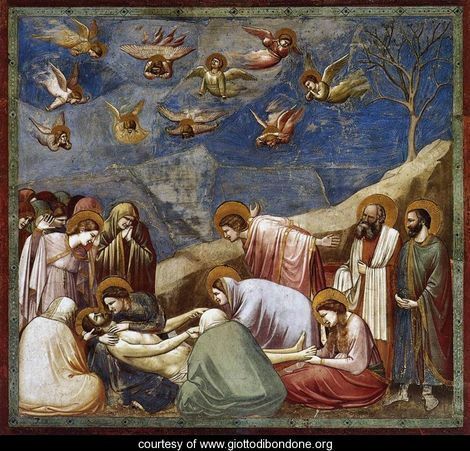 Giotto di Bondone (c. 1267-1337) was a highly skilled Italian painter who is considered to be a founding contributor to the renaissance in Europe. He was known for his masterful rendering of his subject’s faces denoting their expression and intent but also he favored to paint his subjects in more naturalistic poses which was not common for commissioned artists to indulge in. His magnum opus was his ornamentation of the Scrovegni Chapel in Padua Italy of which this choice comes from. Giotto certainly lived in a very turbulent time for the arts in Italy. It must have been a time of great longing for the traditionalism of past styles and the uncertainty and anticipation of the newer, then, avant-garde styles emerging from the minds of these young artists. Artists who recreated these religious themes must have felt pressure from their benefactors to produce works that respectfully displayed those sacred events in a safe and familiar way, but still yearned to make a personal statement and add dimensions that had never been fully explored to their pieces. The painting of these religious appointments was an honored task among the artisans of the day. The measure of a prominent artist in this time was reflected on his demand by the church (which often had the funding to dispense for such commissions). And in his day, few were able to take their visions in the same direction as Giotto. As stated earlier, the environment Giotto lived in must have teemed with creativity in all aspects of life. It was the beginnings of a new era where the reemergence of old customs and forgotten knowledge seemed to have no end. Italy was the epicenter for the “rebirth” of humanity in the western world and with all the remembrance of civilizations past came a new inflexion of modern ideas that stood in conflict with the older ways. Society in this time was recovering from the notions of serfdom and fiefdom and was heavily exploring the limits of its new circumstances. Art was now being produced in new and creative styles, styles that suited the creator of the piece and served not merely for institutional purposes but for art’s purposes. People again had the time to devote their lives to the pursuit of such artistic creation and expression. This work itself embodies all the markers for the Italian renaissance from which it was created. The fresco method is a firmly rooted in Italian religious artistry. A frescoist uses the medium of semi dried lime mortar or plaster that acts as a binder to secure the desired pigment (the pigments were only mixed only with water to dilute them) and applied directly to the binding medium. The subject (the lamentation of Christ) was a popular image at the time that conveyed the pain, anguish, and confusion in that pivotal moment in Christianity. These scenes may well have been meant to “center” and reaffirm the believer with the use of such clear and striking presentations as enabled by their technique. The interior of the chapel was completely engrossed in these Christian scenes making these images widely viewable and vividly emblazoned on the minds of the patrons of the church. The images (characters, environment, etc.) are rendered in a solid color and then either highlighted or low lighted in the same base color (only making hue changes to show darker or lighter areas). This suggests that the availability of quality pigments or specific pigments must have been bountiful then. The technical use of the elongated Christ depiction was a standard practice to denote his prominence in the scene and was certainly not a Giotto innovation but a collective tradition in painting and sculpting that harked from the Egyptian method of modeling important figures in scenes. Also the folding of cloth as fabric does when worn is a possible skill learned from Classical/Hellenistic Greek art where motion, light, and action were important to capture. The sharp usage of space and line to draw attention to the center are virtues common to renaissance art as well as the sharp usage of the fore, middle, and background in the painting. For example, in one corner of the work there is a dry tree perched on an up sloped hill diagonally bisecting the painting that (in this native region) represented death and drew the eye towards the main scene. This technique would have been a universally understood visual cue for the viewers to follow. The heads of all important Christian figures were highlighted with a golden halo to name them to the viewer as the expression of their faces seem to have so much to say to the viewer. The clarity with which one can derive the emotion and reaction on any of the faces within say much for the ability of the artist and what was important culturally at this point in time for Italian society. Giotto did add his own unique perspectives to the piece with the angelic figures in the sky above the crowd. He masterfully painted them flying in varying directions with each one having their own perspective and horizon point. The solemn and excited nature of this artwork that combined with the fervor in which Christianity was spreading during this time was surely able to help drive the point “home” to the common people of the time. Reading was not a normal ability at that time yet (especially for common people) and the best way to reinforce the verbal teachings which were being delivered from the pulpit was to have visual examples for believers to contemplate about. There is no doubt in my mind that all who looked on the lamentation walked away with all the intent and energy that Giotto had envisioned his work would generate.